Thanks to its compact construction and 2 tap design, this Micro Matic D4743DT-PVD tap tower allows you to provide customers with multiple brews to choose from and is an excellent addition to small pubs where available space is limited! It can even be used as a replacement for the damaged component on your kegerator. 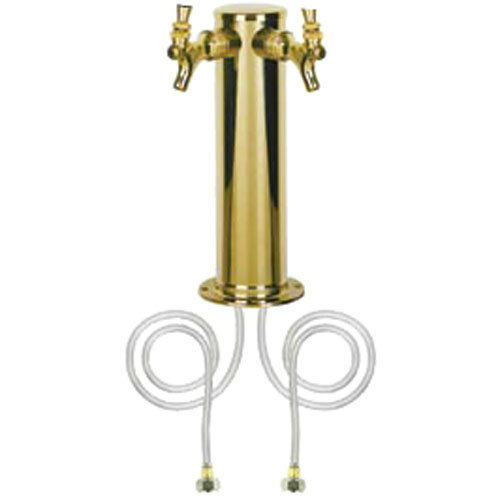 This model features an unmistakable 3" column design, which is the most common tower configuration for beer keg dispensing in the industry. And thanks to its air-cooled configuration that keeps the hoses chilled inside of the tower, your beer is sure to dispense at the perfect serving temperature from the first pour to the last! This 2 tap tower features a sleek tarnish- and scratch-resistant PVD brass finish that is sure to complement your bar's existing taps. The unit ships with a variety of extras that make installation a breeze, including (2) 5' x 3/16" hoses that are brewery-approved so you can be confident they won't be damaged by normal cleaning products like some others on the market. The faucets each come with a PTFE lever washer for smooth, consistent performance and simple operation, a solid brass faucet lever, and a chrome-plated bonnet, shaft, and collar. To save you a trip to the hardware store, it even comes with a mounting gasket and other mounting hardware!